Dichondra micrantha used as a turf alternative. Dichondra micrantha is a low growing, groundcover plant that was once touted for use as a lawn in the mild west, but flea beetles quickly drove it out of favor as a grass substitute. Now a related species, D. argentea, is taking center stage nationwide as a unique, trailing accent plant for containers and hanging baskets. 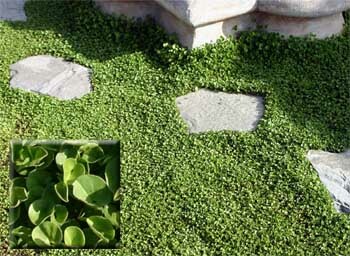 Dichondra has small, rounded leaves that resemble miniature water lily pads and spreads by rooting surface runners. Native to Texas and Mexico, D. argentea is a perennial hardy in zones 8 to 10, but is being used as an annual foliage plant in the horticultural trade. ‘Silver Falls dichondra has silvery fan-shaped leaves. ‘Silver Falls’ dichondra is a vigorous plant that forms a mass of soft pewter leaves on silver stems in full sun to part shade. The fan-shaped, shimmering silvery leaves are held on plants just 2 inches tall. The trailing stems branch well without pinching. It is heat and drought tolerant and will recover quickly if watered after wilting. In the Midwest, dichondra has no serious insect or disease problems. 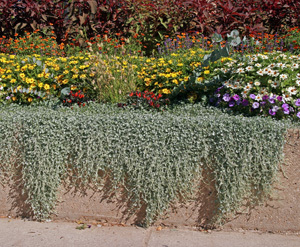 Silver Falls dichondra used as a trailing plant over a wall in an annual bed. ‘Silver Falls’ dichondra is great alone or in mixed containers, providing a cool contrast to green foliage and brightly colored flowers. Try it in hanging baskets, tall containers, or window boxes as an alternative to licorice plant (Helichrysum petiolare minus ‘Silver Mist’). It combines well with ‘Tidal Wave’ petunia, ‘Angel Mist’ angelonia, or ‘Dragon Wing Red’ begonia. Like other silver plants, it goes well with purple, pink or blue flowers and foliage. For a sophisticated look, plant it with white, pale pink and pale lavender flowers. Other suggested plant combinations include Persian Shield (Strobilanthes dyerianus) and ‘Duckfoot’ coleus; petunias, ivy geranium and lobelia; or an all-foliage mix with chartreuse and black sweet potato vines. Planted near the edge of a raised bed or rock wall, it will cascade over the edge, growing 2 to 4 feet long. It can also be used as a ground cover on well-drained soils, where it will form dense mats that choke out weeds. Try pairing it with colorful foliage plants, such as ‘Purple Knight’ alternanthera or sun-tolerant coleus. ‘Silver Falls’ can even be used as a trailing filler for cutflower arrangements. Silver Falls dichondra as a groundcover. 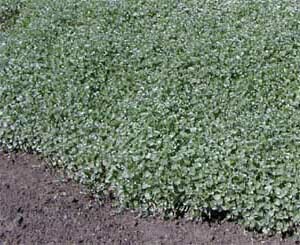 Dichondra can be purchased as bedding plants or started from seed. If you intend to grow your own, start the seed indoors 12 weeks before last frost. Cover the seed lightly and keep the soil evenly moist until the seedlings have completely emerged. Warm temperatures (75ºF) and high humidity is necessary for germination in 1 to 2 weeks. Dichondra prefers warm, dry growing conditions, so let the plants dry out well between waterings once they are larger. Transplant to larger containers at 7 to 8 weeks or when plants have several true leaves. Provide as much light as possible, to produce a more compact plant and better silver color. Until recently, seed of ‘Silver Falls’ dichondra was only available to wholesale growers. It is now available to homeowners in the US from only a few retailers, including Park Seed (Greenwood, SC), Pinetree Garden Seeds (New Gloucester, ME) and Stokes Seed (Buffalo, NY). Some foreign sources include Veseys (York, Prince Edward Island, Canada), Nicky’s Nursery (Kent, UK) and Egmont Seed Company Ltd (Christchurch, New Zealand). Another recently-introduced variety, ‘Emerald Falls’ (offered as D. repens, which is just a synonym of D. micrantha) also works well in hanging baskets and mixed containers, as well as as a ground cover. Its leaves are more rounded than ‘Silver Falls’ and it produces a wider but shorter plant. These heat tolerant plants branch heavily early, then the runners tangle to form a dense, tight mass with a less spreading habit. I love this plant. I am also glad to see that it’s flea beetles that eat it. We have used various for “spills” in container planters which we use a lot of around our home but the silver falls are the most appealing one I’ve seen in a long time. I love the look of the dichondra silver falls along with the coral black elephant ears, as seen in the video. I am anxious to locate both of the these plants in a garden center this spring to use in a area in front of my home. It will be spectacular!!! The dichondra appears to shimmer…so beautiful! I have used the licorice plant in the past as a trailer in my containers but this Dichondra with the leaves resembling the miniature water lily pads will be on my list to try in my containers this year. Informative article. Thx. Help! I have 3 plants & 2 of them are drying out & the leaves are falling off. I’m not doing anything different with the other one but that one seems to be doing ok.
Silver falls is a vigorous plant that forms a mass of soft pewter leaves on silver stems in full sun or part shade. The fan-shaped shimmering silvery leaves are held on plants just 2 inches tall. The trailing stems branch well without pinching. It is heat and drought tolerant and will recover quickly if watered after wilting. In the midwest this plant has no serious insect or disease problems. Silver falls is great alone or in mixed containers, providing a cool contrast to green foliage and brightly colored flowers. To: R. Wade… FYI, I’m in the Cherry Hill area and the Dichondra I planted into the ground (warmer protected spot) completely died back but re-emerged in late Spring 2017. I love this plant! This summer I paired it with Dorotheanthus “Mezoo” Trailing Red, and the combination of that silver and the texture of the “Dorothy” just made me smile! (Also had a couple petunias in there…) I have been trying to find “Emerald Falls” and none of our local spots seem to stock it. I’ll keep looking! I see a gorgeous hanging plant of this dichrondra “Silver Falls,” half off at local nursery. Will it survive a NJ winter indoors in a south-facing window?